The Biceberg in action. Photo courtesy of Biceberg. A version of this post was originally featured on TheCityFix Brasil by Maria Fernanda Cavalcanti. Bicycle storage is traditionally very simple. Typically, a banded piece of metal is affixed to the ground, allowing the cyclist to lightly anchor to bike to rack with a lock or chain. However, any urban cyclist can tell you the perils of theft: of seats, or wheels, or lights and gears gone…sometimes even the whole bike. Even with added layers of security –multiple locks, levitated locks, handle bars that double as locks- bikes and the gear we ride them with are at peril in the open: such is the pickle that motorfree wheeled transport puts us in. Riders in four cities across Spain have another option. Enter the Biceberg! 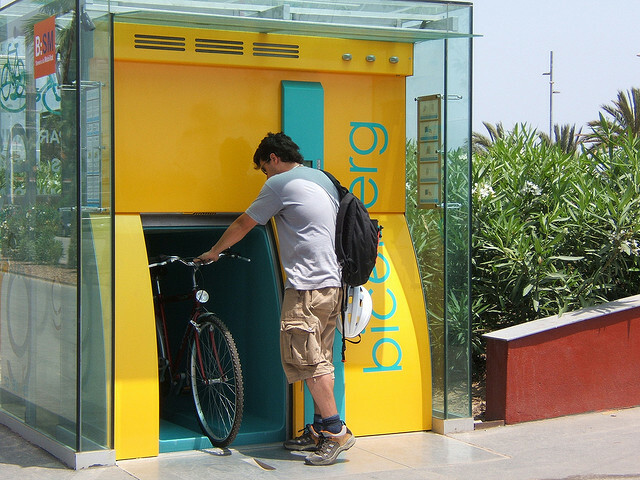 Though these bright yellow kiosks might be mistaken for an ATM or a modern public toilet, Spanish cyclists are privvy to their space saving, high tech bike lockers. Like an iceberg the Biceberg’s compartively small footprint on the street hides the storage facilities built below the surface. To store your bike and accompanying gear, registered users insert their membership cards and recall their cycles from the Earth like a parker at a double decker car garage -or a reserved book from a library . Though the Biceberg has been around since 1994, worldwide renewed interest in biking as a low carbon, low cost, healthy method of travel has cast light on the usefulness of biking overall. Additionally, for its small footprint, the Biceberg can can hold 92 bikes in its sub-terranean cavern, leaving dense urban streetscape free for pedestrians.